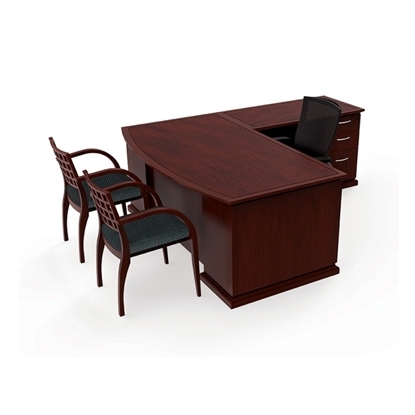 The AT22 L shaped desk with hutch features a peninsula front design that is both attractive and functional. It works well for small, impromptu meetings where visitors can pull up to your table. There is plenty of space for your laptop as well, allowing it to work as an executive looking computer desk. The Sonoma by Office Star L shaped desk with bow front and wood veneer features a multi-radius wood veneer design. 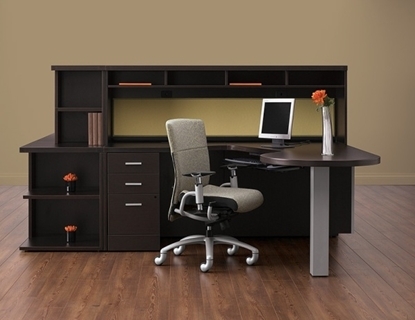 This desk fits beautifully in any office environment, home or business. Perfect for the executive office or personal workspace. Free shipping and warranty available on all discount office desks. This "P" Island L shaped desk is unique in style representing a very modern look that is perfect for a high tech office. This product offers ample drawer storage underneath the tops and bookshelves and cubbies for project materials in the hutch. This Zira desk by Global is part of an extensive series of offerings that range from Executive Desks to storage and general office furniture to filing and storage. All Zira units are eco-friendly, good for our environment. This traditional style L shaped desk with wood veneer from the JSI Brogan series features decorative molding, cherry or hand-rubbed walnut veneers, polished brass hardware, and ball bearing drawer suspensions. There is generous work surface space and plenty of drawer storage. Perfect for an executive or home office setting. 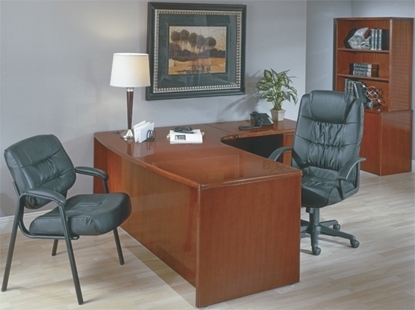 Free shipping on all discount office furniture collections. The Global Princeton L shaped desk is designed to build out from where you work unlike most traditional desk systems which are designed to build out from the wall. Overlapping work surfaces render a flexible footprint that is simple to reconfigure. Get free shipping when you order today! The Cherryman Emerald bow front L shaped desk features a 1 1/8” thick top and a solid wood profiled edge on all four sides. This wood veneer desk is made from premium grade quality materials from our large collection of office furniture. In addition, both tops and panels used a 3 ply balanced construction. Free shipping and warranty available on all office furniture. 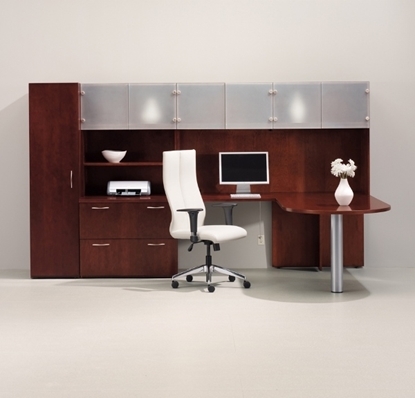 Global Zira is a contemporary, commercial-grade laminate desk with extensive options to personalize your workspace. 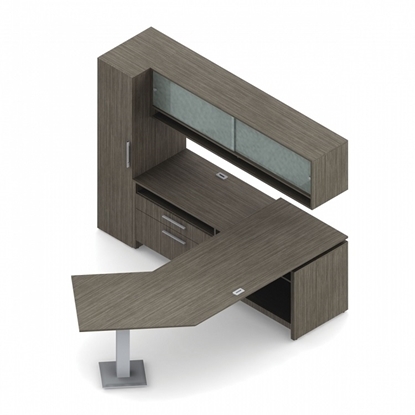 This L shaped desk configuration meets all of your work surface and storage needs. Most components ship fully assembled. Premium full extension progressive ball bearing slides on file drawers. Order today and get free shipping! 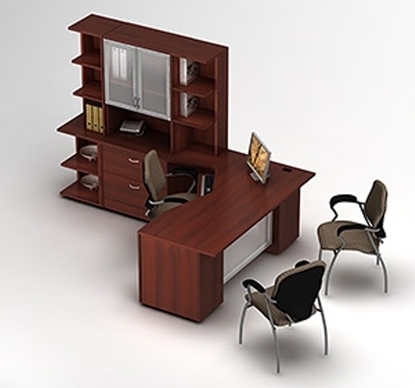 JSI Vision is an eco friendly L shaped desk from our large selection of office products. This GreenGuard® certified desk features a 1 3/16" thick laminate top and is available a number of finishes and edge details. Free shipping and warranty available on all discount office desks.